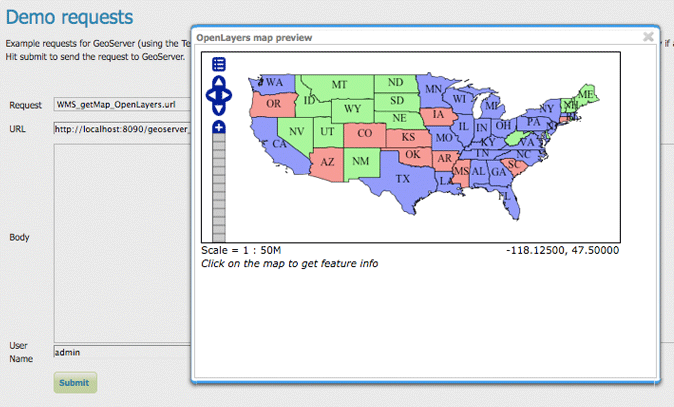 This page contains helpful links to various information pages regarding GeoServer and its features. 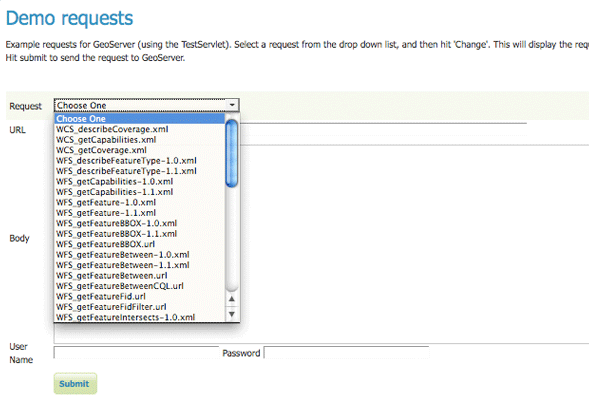 You do not need to be logged into GeoServer to access this page. 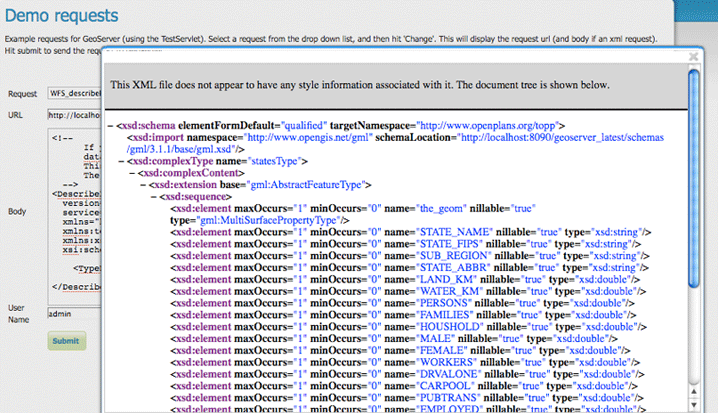 This page has example WMS, WCS, and WFS requests for GeoServer that you can use, examine, and change. Select a request from the drop down list. Both Web Feature Service (WFS) as well as Web Coverage Service (WCS) requests will display the request URL and the XML body. Web Map Service (WMS) requests will only display the request URL. Click Submit to send the request to GeoServer. 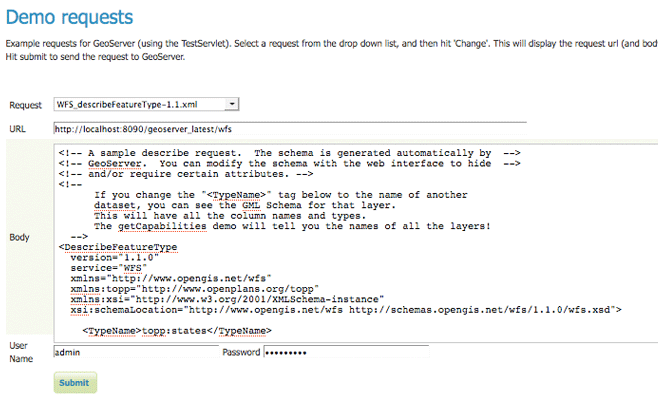 For WFS and WCS requests, GeoServer will automatically generate an XML reponse. Submitting a WMS GetMap request displays an image based on the provided geographic data. WMS GetFeatureInfo requests retrieve information regarding a particular feature on the map image. 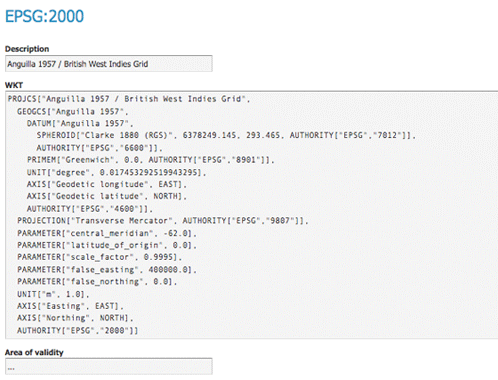 GeoServer natively supports almost 4,000 Spatial Referencing Systems (SRS), also known as projections, and more can be added. A spatial reference system defines an ellipsoid, a datum using that ellipsoid, and either a geocentric, geographic or projection coordinate system. This page lists all SRS info known to GeoServer. The Code column refers to the unique integer identifier defined by the author of that spatial reference system. 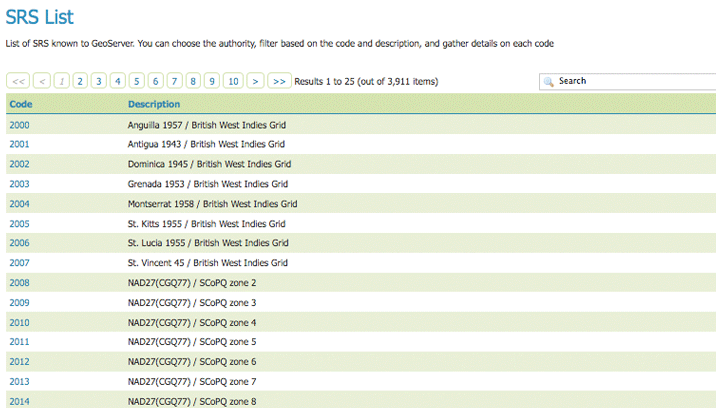 Each code is linked to a more detailed description page, accessed by clicking on that code. The reprojection console allows you to calculate and test coordinate transformation. 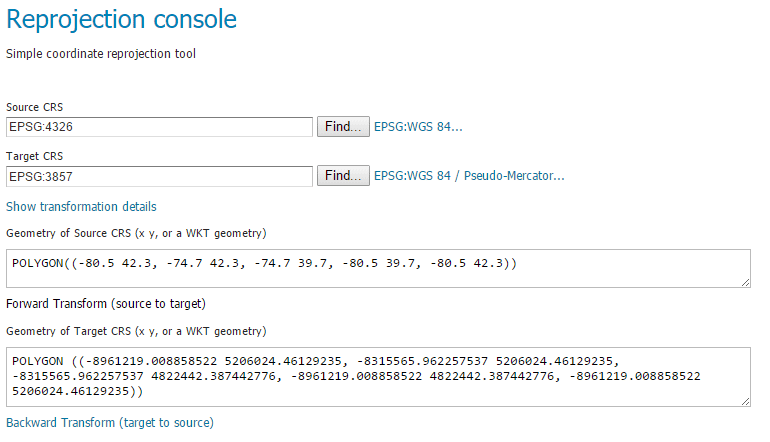 You can input a single coordinate or WKT geometry, and transform it from one CRS to another. For example, you can use the reprojection console to transform a bounding box (as a WKT polygon or line) between different CRSs. Use Forward transformation to convert from source CRS to target CRS, and Backward transformation to convert from target CRS to source CRS. 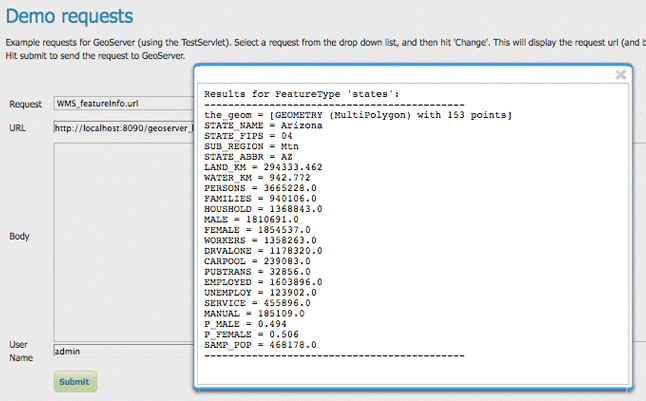 You can also view the underlying calculation GeoServer is using to perform the transformation. Read more about Coordinate Reference System Handling. The WCS Request Builder is a tool for generating and executing WCS requests. Since WCS requests can be cumbersome to author, this tool can make working with WCS much easier. Read more about the WCS Request Builder. 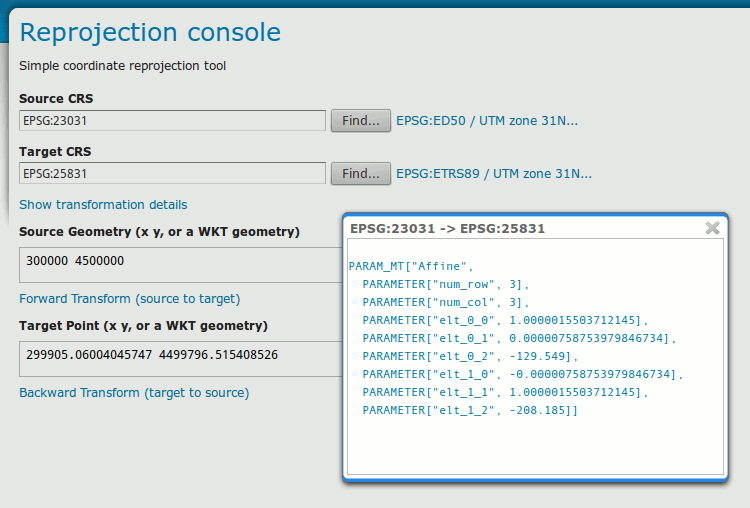 GeoServer with the WPS extension installed includes a request builder for generating and executing WPS processes. Since WPS requests can be cumbersome to author, this tool can make working with WPS much easier. Read more about the WPS Request Builder.